Can I Make Doughnuts Out of Frozen Biscuits? Make your own shaped cookies with ready made sugar cookie dough. 4 Can I Make Doughnuts Out of Frozen Biscuits? Save time when cooking custom cookie creations by skipping the stirring and using ready made sugar cookie dough. These convenience products come in rolls or tubs from the refrigerated case at grocery stores. Never worry about running out of sugar to make cookies again when you have refrigerated dough on hand for a freshly baked cookie fix in minutes. Dust a clean surface with ½ c. powdered sugar. Remove the cookie dough from the package and roll to ¼ inch thickness using the rolling pin. Press cookie cutters into the rolled dough and pull out the shapes. Set the cookie cut outs two inches apart on an ungreased cookie sheet. Bake the cookies for seven to 11 minutes or until the bottoms of the cookies just begin to brown. Leave the cookies on the baking sheet for two minutes before lifting with a spatula and moving to a cooling rack to cool completely. 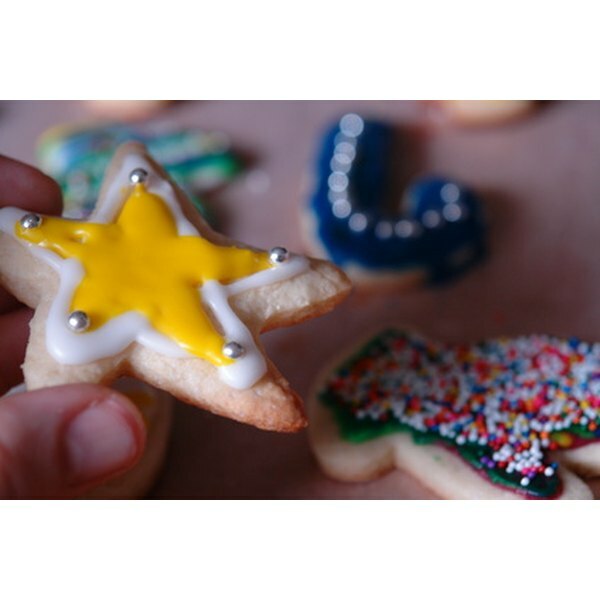 Optionally, use cookie decorations such as frosting and candies to customize your baked cookie shapes. Try one of these options if you do not have cookie cutters: Use a can opener to cut out the top and bottom of a clean tuna fish can to substitute for a cookie cutter. Cut out shapes in the dough using a knife. Can I Freeze Unbaked Biscuits? How to Make Sugar Wax?